← Christmas Giveaway – winners announced! Sharp as a snake's fang. James Hetfield is known for his sharp and bone crushing rhythm guitar work in Metalllica. He has also played a few memorable solos in his time. Everything about is playing is very sharp and precise, and it’s no surprise that he would prefer a sharp tipped pick for his playing style. When Jim Dunlop announced the new range of Hetfield Black Fang picks I was very excited about the style of pick designed for Hetfield. I’m a big fan of thick, sharp tipped picks, and have been playing black Jazz IIIs and Jazz III XLs for some time now. I have found them to give me the perfect tone and attack both for my rhythm and lead playing. I’m a very heavy hitter of the strings, and I have found the Jazz IIIs to take some time to wear out for me. The Black Fangs come in three different gauges, .73, .94, and 1.14mm. Since I prefer a thicker pick the 1.14mm gauge interested me the most. Thanks to Jim Dunlop I received 1.14mm gauge Black Fangs for me to review. As someone who has been playing the black Jazz III range for some time I immediately noticed that the 1.14mm Black Fang was definitely a bit thinner than the black Jazz III. The Black Fang felt a little unnatural at first due to this, but as soon as I started playing this was quickly forgotten. The sharp tip, and fairly sturdy ultex material meant that I bonded really quickly with the Black Fang, and it felt quite natural very quickly. I find most picks very awkward if they are 1mm or less, and don’t have a sharp tip. This was the first pick I had played in some time that wasn’t a black Jazz III that I felt I could play with comfortably. Feel is one thing with a guitar pick, but tone is another. Picks make a small, but not insignificant effect when it comes to a players tone. I found the Black Fang to provide a great sharp biting tone, a little more so than the black Jazz IIIs I normally play. I really loved the tone as it gave great definition to notes, both for rhythm and lead playing. This is good for clean guitar playing, and fantastic for heavily distorted rock and metal guitar work, as it helps notes cut through all the dirt. So the Hetfield Black Fang pick felt good, and had great tone, but there is one more very important thing when it comes to guitar picks – longevity. As I had mentioned earlier I am a player that has a fairly heavy attack, and I really give a pick a thrashing with fast picked rhythm work, and pick scrapes, as well as the occasional lead part. I had given the Black Fang a really good workout jamming with my band for an hour and a half. The pick I used was brand new, never played when I started jamming, and when the band had finished up for the afternoon I had a closer look at the edges of the pick. I noticed that the pick was showing the signs of a good beating. I had carved a couple of notches in the side of the pick that hit the strings from my pick slides, and I had worn the edge down quite considerably considering it had only been through an hour and a half worth of playing. I haven’t noticed any notches carved out of the black Jazz IIIs from pick slides, and the tips take quite some work to wear down. So it comes down to a matter of tone verses longevity. I personally loved the tone of the Black Fangs, probably a little more than my usual staple pick, the black Jazz III XL. The Black Fangs have a slighlty sharper, more cutting tone that really gets through the dirt. I would however prefer that they were a bit thicker. 2mm would be perfect, and I believe that they would still retain the sharp/cutting tone with the ultex construction. I’m not sure that I would personally stick with the Black Fangs over my usual Jazz III XL picks due to the fact that my hard playing style really cuts the Black Fangs up. If they are readily available at my local music store, and not too expensive I may very well stick with them. I think that I would at least keep a few around for recording purposes. If you are looking for a great sharp tipped pick with fantastic cutting tone and definition, and aren’t quite as heavy as your pick as I am you should definitely check out the Hetfield Black Fang picks. Even if you are pretty rough on your picks you should still give them a test drive. Dunlop have created a fantastic pick for rhythm and lead players alike, especially if you predominately play heavier music. 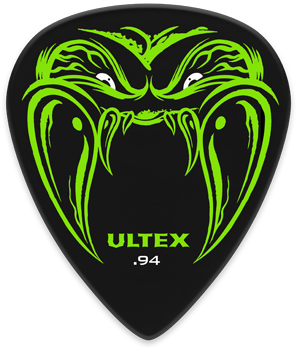 4 Responses to "Dunlop Hetfield Black Fang 1.14mm pick – review"
Maybe the Ultex Jazz III would be more your style? Have you tried them? Yes, I’ve tried the Ultex Jazz IIIs. I quite liked them, but I wish they came in the Jazz III XL size. 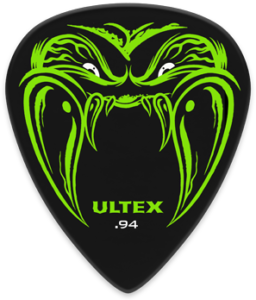 The Ultex Sharp might be an alternative to Jazz III XL – have you tried them? They seem to be the same shape as Black Fang, they just dont have the same thickness gauges.